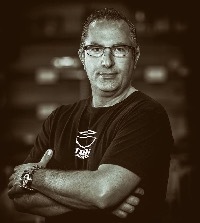 In 1990, when Mike Dorfman founded Trick Percussion Products with a single drum polish and a pickup truck, he had no idea where it would lead him. Decades later, Trick’s products are sold in over 30 Countries, and our products have grown far beyond polishes and cleaners. Mike's early years in the racing industry exposed him to the precision involved in success. Being a constantly curious person, Mike attended numerous trade shows, analyzing designs and implementations across many technical industries to see how they could apply to the development of the best products created for drummers. Our products and designs are a direct reflection of our desire to set the highest standard in the industry. Starting with the finest materials available, coupled with the most advanced techniques in CNC milling, and laser cutting machines allow Trick to create precision instruments and products that overcome the limitations traditionally found across the drum industry.